The Lexus GX460, the lush version of Toyota's archaic, body-on-frame 4Runner, gets a revamp, a new 4.6-liter engine, and a fresh lease on life for 2010. The question is, will anyone notice? The more things change, the more they stay the same: Lexus recently unveiled the latest iteration of its three-row, body-on-frame SUV, and it bears a striking resemblance to the anachronistic, high-sided truck that came before it. The vehicle you see here is set to reach showrooms in January, replacing the aging GX470. A 301-hp, 4.6-liter V-8 tags in for the 470's 4.7-liter lump; it brings with it 38 more horsepower, thirteen percent better fuel economy (15/20 mpg versus the 470's 14/18), slightly more torque, and a new six-speed automatic transmission. A host of interior improvements, new sheet metal, and an updated frame come along for the ride. Frankly, we're not quite sure what to make of this. The GX and 4Runner have spent the past few years in the equivalent of SUV no-man's land, the place where outdated, capable-yet-dull trucks go to be forgotten. The GX occupies the same demographic territory as the BMW X5 and Mercedes-Benz ML — leather-lined station wagons on stilts, both — and it's significantly cheaper than either, but something is missing. Yes, it's remarkably capable off-road. And yes, it's a good answer for people who want little more than towing capacity, build quality, and three rows of tech-heavy seats. But why does the phrase "affordable luxury" have to mean anodyne styling? Or, for that matter, prehistoric chassis technology? Here's hoping that the next GX will be good enough to make these questions irrelevant. We'll know more after the L.A. show, but for now, take a look at the gallery and the attached press release. Positioned between the brand's LX 570 premium luxury utility vehicle and unibody-based RX models, the 2010 GX 460 combines "right sized" midsize packaging with family-friendly comfort and premium craftsmanship. The GX 460 has a standard seven-passenger configuration. Once again built with rugged body-on-frame construction, the 2010 GX 460 is also equipped with full-time four-wheel drive and the advanced Kinetic Dynamic Suspension System (KDSS) to help provide both exceptional on-road ride and handling and true off-road capability. The 2010 Lexus GX 460 is powered by an all-new 4.6-liter V8 that is both more powerful and more efficient than the 4.7-liter V8 it replaces. The new engine produces 301 horsepower and 329 lb.-ft. of peak torque, and is teamed to a new six-speed automatic transmission with sequential shift. Combined city/highway fuel economy is improved by 13 percent to an EPA-estimated 17 mpg (vs. 15 mpg in the 2009 GX 470) — better than other V8 luxury utility vehicles and competitive with some six-cylinder models. 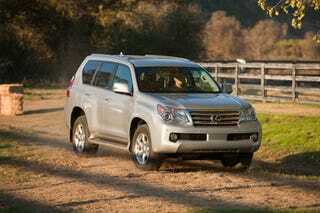 The GX 460 has an EPA-estimated 15 mpg city and 20 mpg highway. The power rack-and-pinion steering system helps make it easier to maneuver the GX 460 in tight spaces. Rear Adjustable Height Control (AHC) enhances the vehicle's flexibility in a wide range of driving situations. When the transmission is shifted into low range, Crawl Control regulates engine speed and output, along with braking force, to propel the vehicle forward or in reverse at one of five low-speed settings. This allows the driver to maintain focus while steering over very rough level ground or steep grades, without having to also modulate the throttle, or brake, pedals. Crawl Control also actuates the front and rear "virtual" locking differentials to help reduce tire slippage and optimize chassis behavior. A rear back-up camera is standard on the 2010 GX 460. The camera provides the driver a view of what its lens can detect behind the vehicle when engaged in reverse gear, projecting the image on the standard 4.2-inch multi-information display, or the optional navigation system's LCD display. Lexus makes personalizing the GX 460 easy for 2010 by offering a Convenience Package and a Comfort Plus Package, as well as making many of the packages' features available as stand-alone options. The Convenience Package includes electrochromic exterior mirrors with power retract, and Intuitive Parking Assist. The Comfort Plus Package includes semi-aniline leather; heated second-row outer seats; wood-trimmed steering wheel and shift knob; and three-zone automatic climate control. Lexus designed the 2010 GX 460 to combine function and elegance, with unmistakable brand identity rooted in the L-finesse design language. The overall effect conveys the vehicle's full-range capability and luxury credentials. A key goal of the designers was to have the vehicle create the impression of being sculpted from a single block of metal. With eDestination, drivers can go online via LexusDrivers.com to save and sort destinations in up to 20 folders, each holding as many as 10 destinations. Then drivers can send the locations-up to 200 at a time-to their vehicle, where they will be available for download into the navigation system. Online, drivers can create personalized location names (e.g., "Favorite sushi," "1 PM Appt," "Kids' doc," etc.) and even list notes about their saved locations, all helping them see exactly the information they choose in the vehicle.